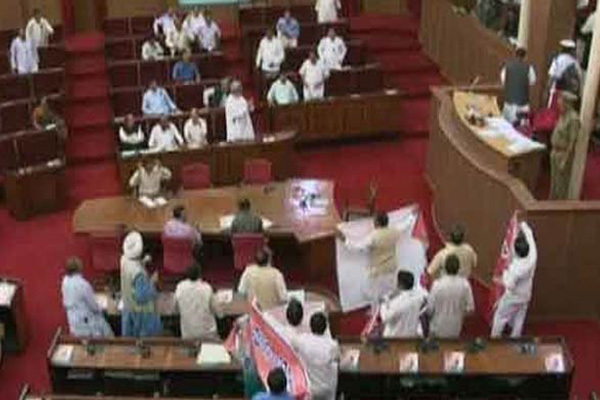 The Odisha Assembly started the winter session with a silence which ended in a noisy commotion. The day initiated with paying tributes to the demise of active leaders & personnel by Odisha CM Naveen Patnaik. After that followed a one minute silence insisted by the Speaker, Pradip Kumar Amat. Then, the opposition leaders dashed to the well of the house decibeling on farmer’s issue. The oppositions then pitched up their slogans. This led to the first adjournment of the House till 12:14 PM. And with the slogans never ending, the house was suspended till tomorrow by the Speaker. Earlier in the House, the tributes were paid to Late Prasanna Kumar Pal, late Bansidhar Sahu, late Champeswar Mahakud (former of the Assam 22 rifles), late Brajmohan Behera(ex-CRPF driver) & Achyutanand Sahu (former Doordarshan cameraman). Opposition Leaders Narasingha Mishra (Congress) & K.V. Singh Deo (BJP) also paid condolences.